The news had been telling us it was coming all day, and now it was here, accompanied by fog. 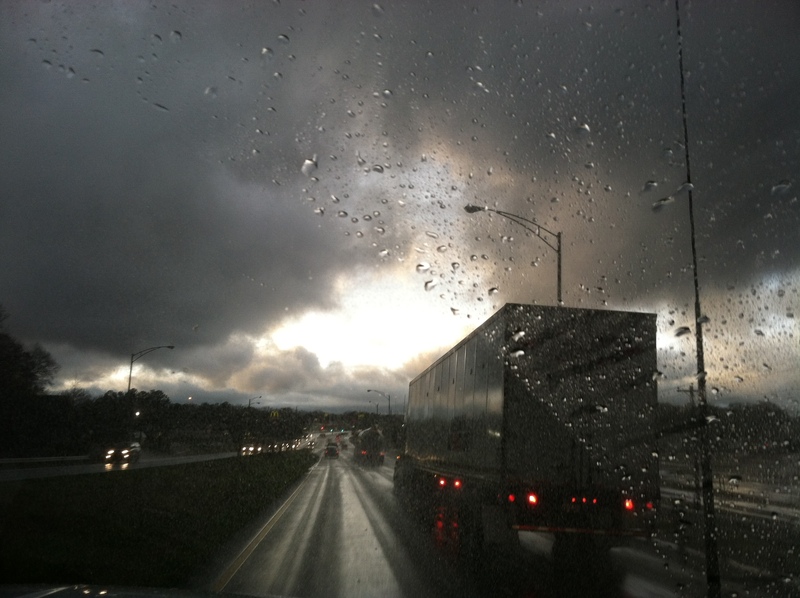 Rain seemed to make night come more quickly and driving down the highway alone in the wet dark felt challenging. Doc and I were “glamping” (glamorous camping) in our new Airstream when I got a call from my daughter, just after lunch. She called to say she was sick and needed help with the children. We live four hours from her, but this weekend we camped about 40 minutes away. So, I kissed Doc before leaving him with the camper, not wanting to expose him to this virus. I drove to the first grocery store I saw to stock up on things like Gatorade, Sprite, eggs, ham, and milk, then headed to her house. The grandchildren squealed with delight as I walked in toting white plastic bags that held the promise of goodies, and of Gigi cooking. Ham, mushroom and sautéed onions went into a quiche. As they ate they told me about their day. “Did you know ‘M’ was for mouse and there is one in the backyard?” The young ones covered their slice with ketchup, as the older ones chose sour cream and salsa. My daughter had a few bites with her Sprite then returned bed to sleep. As darkness began to fall, I hugged them all and promised to check on my daughter tomorrow, then headed back to camp. I’ve traveled these roads for years visiting family and friends. But tonight, they seemed unfamiliar as rain and fog distorted landmarks. At one point I could not tell if I was heading in the right direction. I thought maybe I had missed the exit. Everything looked strange. A stone grew in my stomach as the storm pressed down. I reasoned that Doc couldn’t help me, because he did not know this area as well as I did. I felt like a ship lost at sea, looking for landmarks or a lighthouse to lead me home. My heart pounded as if trying to escape. I tried to slow my breathing and think. Then, I remembered an app Doc and I had put on our phones. It showed us the location of the other when we were apart. My thumb scrolled across my phone as I kept a watchful eye to the road. I found the app and quickly clicked. Soon I could see the shining dot on my phone indicating Doc’s location. I had not gone the wrong way. I was heading right towards him, heading right towards home. Steering for home is never a destination. Home is a relationship or relationships that give your heart life. Even when it is hard to work through difficult situations, home is where you are loved. Home is where you are valued and your gifts are desired. Home, for me, is Doc. Marriage is difficult. Even in our later years we can wrestle with the way we want events or situations to go. As long as there is breath, we work the sails to go forward, or casing the anchor to slow down and enjoy the moments. This is how as we navigate the waters of life together. He is my north star, and I am his and wherever we are, it is home. 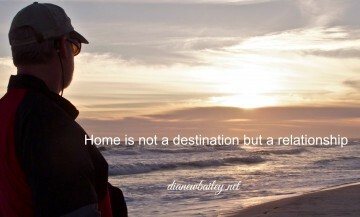 Home is not a destination is it a relationship. Home is not a place it is a person. When Christ was teaching the Sermon on the Mount, he was faced north at some point to help them understand. When you stand on the shores of the Sea of Galilee you face north and see Zefat, a city on the hill. From miles away this city can be seen in the dark. When sailors were fishing at night, they could look up and see the city and navigate safely to shore. As Jesus preach on the Mount he talked about a “City on a Hill” to teach the message that points to our heavenly home and guides us through treacherous waters of life. The light of the Bible always points to Christ, our True North. 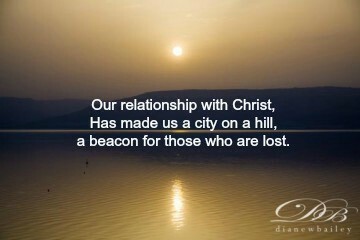 Our relationship with Christ has made us a city on a hill, as a beacon for those who are lost. When we shine the light of Christ in our lives, we guide those lost and tossed at sea, safely home. Beautiful, Diane. In today’s world where there seems to be no true North as far as marriages are concerned, and we are swirling in storms of redefinition or dissolution of marriage. It’s wonderful to read testimonies like this and come home to Christ and how He tells men and women to leave all others (and their parents’ homes) and to come home to true marriage, abandoning all else for the sake of the other. Yes, there can be some rough waters, but it sounds as if you and doc are sailing safely together in the ark, who is Christ. (I don’t know if arks sail, but you get my drift! 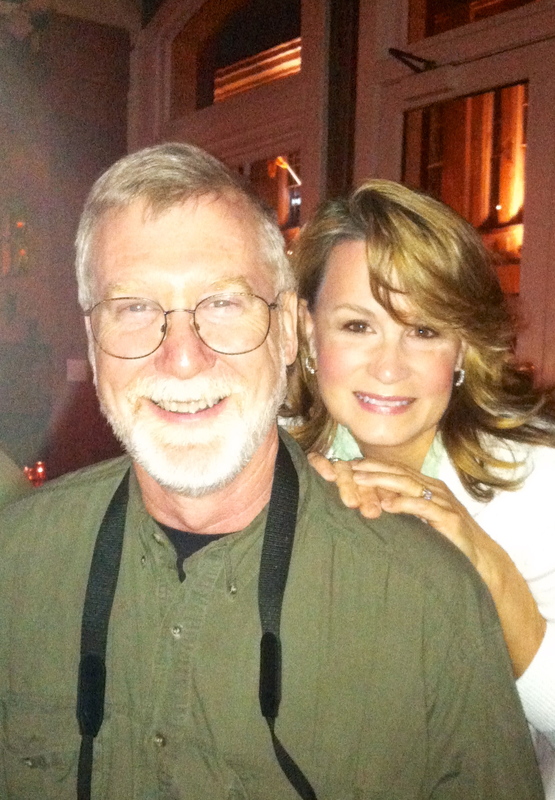 🙂 ) Michael and I will be married forty years this coming Sunday and I just finished writing our Christmas newsletter. He always adds a short paragraph at the end and his last line read: “I wouldn’t want to be without her.” The her he is talking about is me! Michael is a man of few words and little public demonstrativeness, so when I read that, knowing that this letter will go to several hundred people, it really brought me to tears. I wouldn’t want to be without him either. He’s true North for me (and believe me, I’m directionally challenged; but he is always there, centering me, and he always turns me towards home). And how we Christians can rejoice that Christ is Home and that He promises never to leave or forsake us–ever! Home is eternal. Happy Thanksgiving, Diane, and thank you for this beautiful reminder of what true love is. Keep heading north. Keep heading home. Oh my goodness Lynn, your words are so beautiful. Thank you for sharing and encouraging us in marriage. You are a treasure in my life. You are someone I am thankful for this Thanksgiving. Love you! Marriage IS hard! We’ll celebrate our 27th year in December, and there are always challenges to keep us communicating and one our toes–our one constant is our Father in heaven–our true North. Despite our disagreements, we always come back to him and find each other.